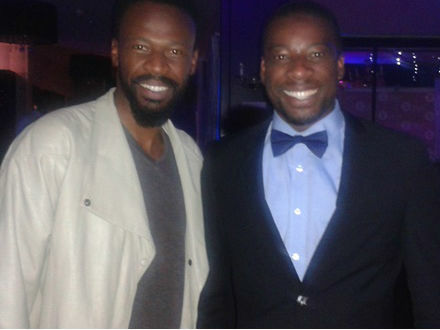 Drum magazine bumped into two soapie hunks Bonga Dlamini of Rhythm City and Lesley Musina from Muvhango. This week, soapies have made the spotlight because of the recent drama between the 16 generations actors who have been fired from the popular soapie. Last week drum revealed that several well-known actors had been approached to take up new roles but refused. These two hunks tell us why they would welcome an invitation to working on Generations and speak about their past and present soapie experiences. Do you think Generations actors are overpaid? Leslie: I thought they earned more than what they revealed to the media and the public, it’s not what I had expected. Would you agree to work at Generations, following the public saga? Bonga: Of course! It is the most watched show on television and South Africans love it. If their management is willing to respect me and my craft as an actor there would be no reason not to go there. What did you do before you landed the role in the soapie you act in? Leslie: I am trained as a television producer by Walela Sudios, I then dabbled in a bit of presenting for a show called Mind the Gap on SABC 2 and persued acting until I landed my role as Ndalamo Mukwevho in Muvhango. Bonga: I studied acting at the Durban University of Technology (DUT) and have played the role of a doctor on Isidingo, a priest on Zone 14 and I’ve played a comedic role in a sitcom. Do you ever worry that once you have acted in a soapie you might stand the risk of being type casted? Bonga: Because I studied acting I know how to move fluidly between roles and break out a character. I’ve also played different roles in different shows, I’m not worried about being type casted. Mutodi Neshehe was adored by fans during his role as the original Ndalamo on Muvhango, how have you managed to fill in his shoes? Leslie: The first time I appeared on Muvhango as the new Ndalamo, I had mixed feelings but I trended for two days in a row on twitter, lots of the comments from the fans were supportive and encouraging.